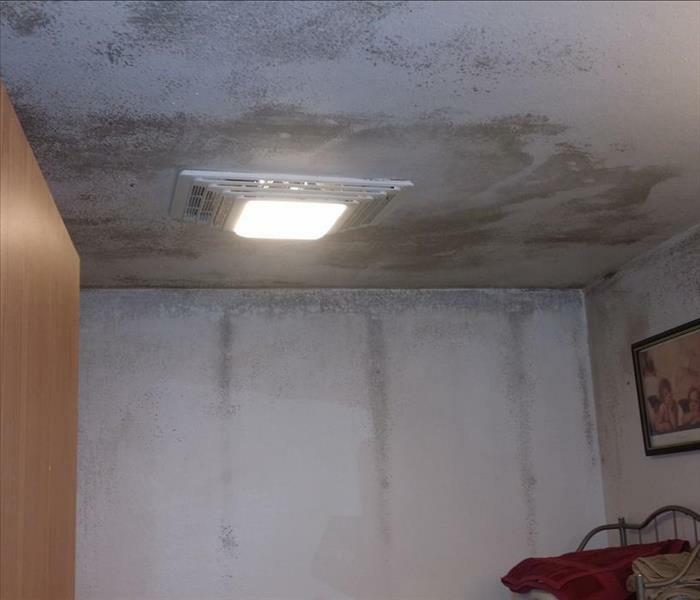 If you have a mold issue in your Shreveport home, our experts can help! 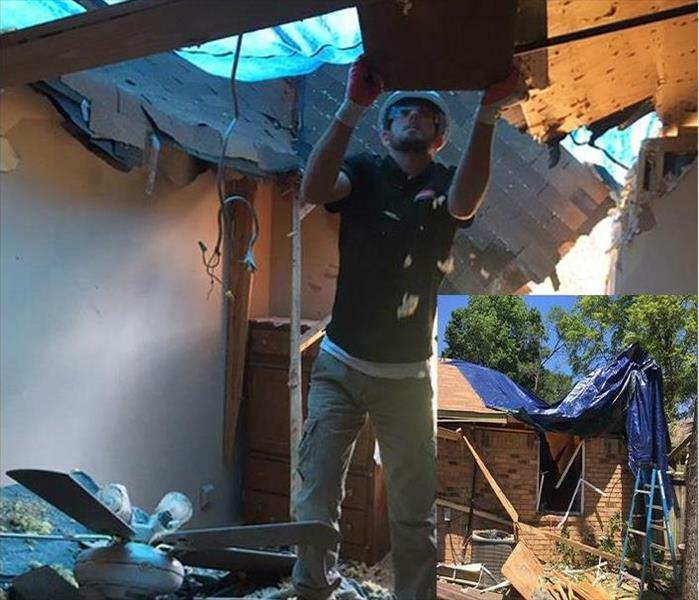 We have the experience, advanced training, and state-of-the-art equipment to restore your home in Shreveport to pre-damage condition. SERVPRO of South Shreveport is locally owned and operated, ready 24/7, and Faster to Any Size Disaster! The flooding caused the floor to be covered in water and some damage to the trim and sheetrock wall panels. 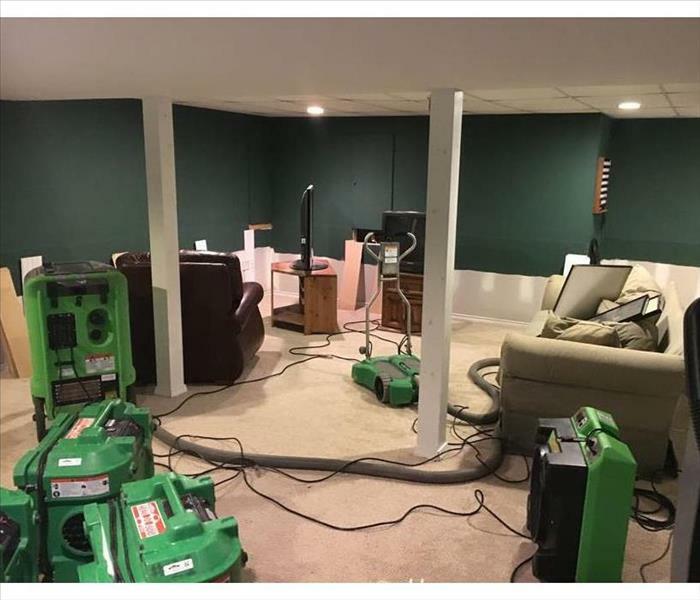 Our SERVPRO team can arrive quickly to vacuum out the water to mitigate the damage. The non-salvageable wall material is neatly cut out to simplify the hanging of new drywall. The furniture is on blocks and covered for added protection. Count on SERVPRO team members to protect your property, as we would our own. 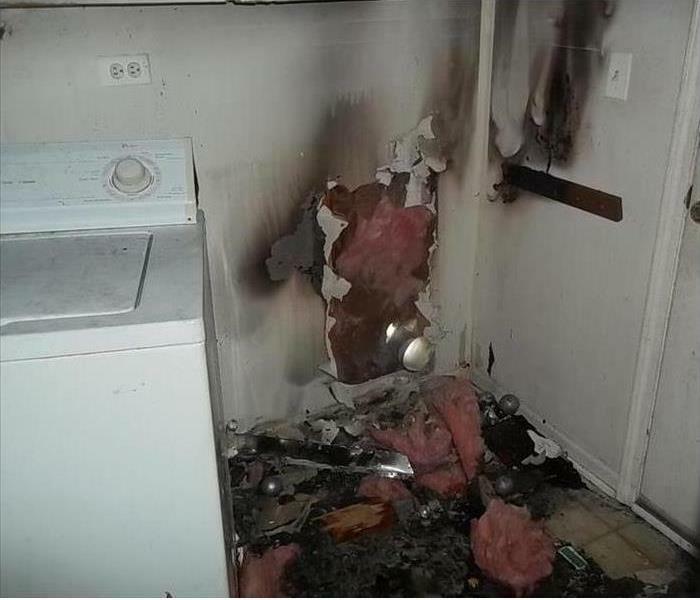 SERVPRO offers a free inspection of your HVAC ductwork and your clothes dryer venting system to help prevent this photo from happening. We have helped many residents in the Forbing area by cleaning and unclogging lint filled vents. However, if you do suffer fire damage, we can clean it up. 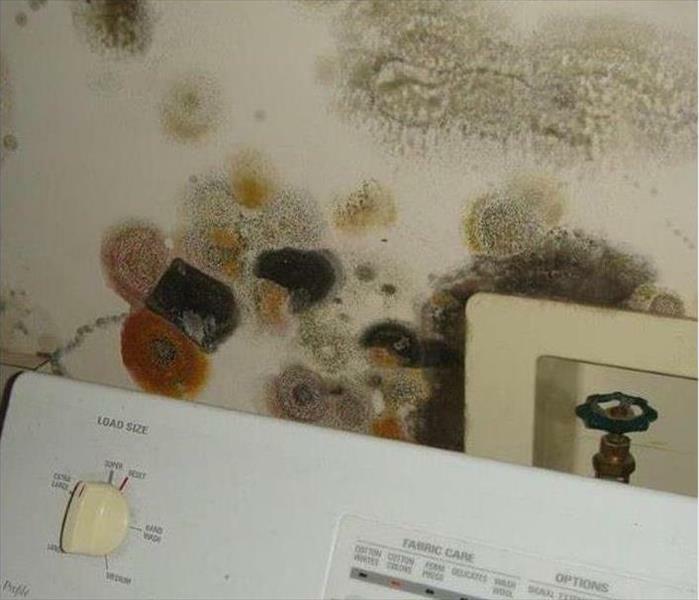 This rental unit in Forbing was vacant, but the moisture allowed many species of mold to grow. Count on SERVPRO to remove the damaged drywall and spray an antifungal biocide to kill any remaining mold spores. 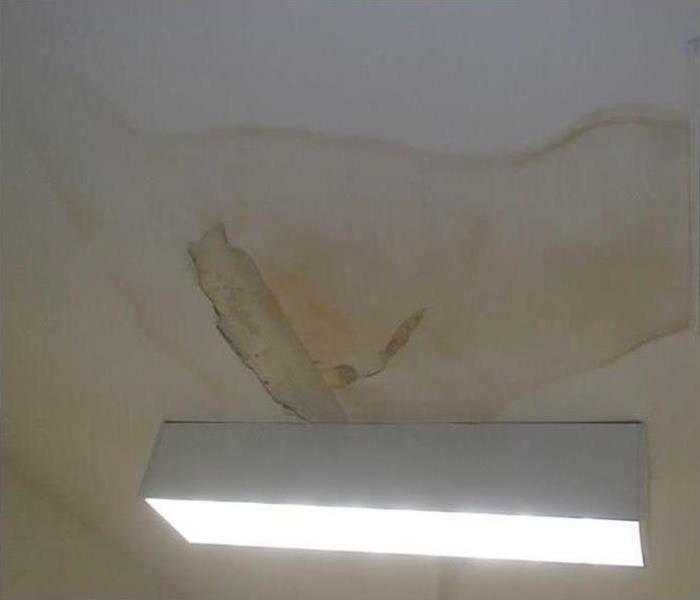 Gallons of water from a hidden plumbing line can soak and ruin a ceiling in Forbing in a very short time. 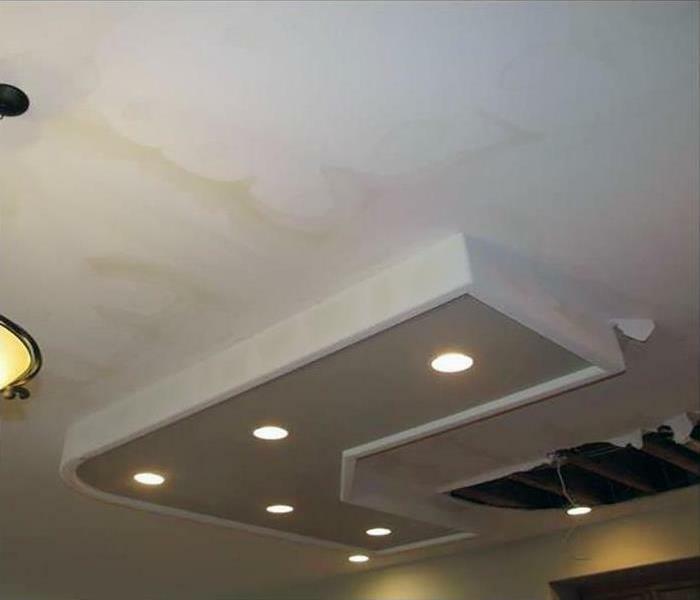 After the leak is fixed, SERVPRO can safely remove the damaged ceiling material, dry out the void, and prepare the water damaged area for the rebuild. SERVPRO prefers to restore rather than replace storm-damaged building elements whenever possible. However, many inches of contaminated black water means the only safe and expedient option is a partial demolition of all contacted surfaces. Our drying equipment is getting this Shreveport house into a pre-build back condition. 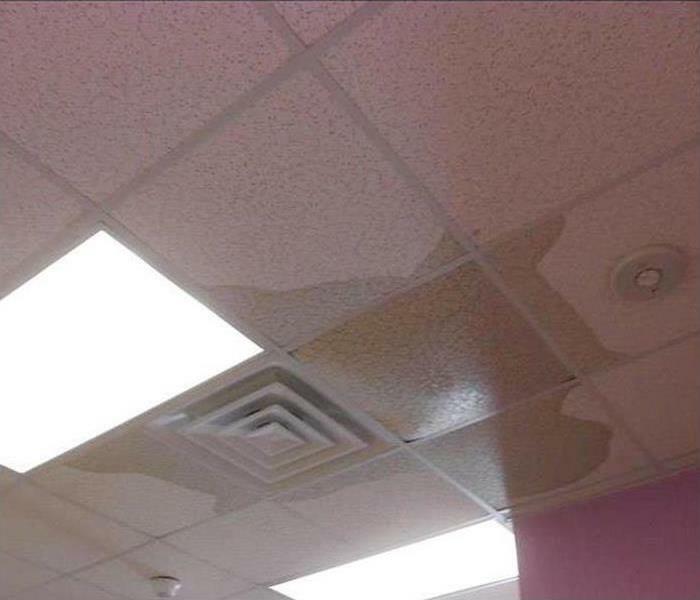 If your business has experienced a water damage disaster, you need the team at SERVPRO right away. We are ready 24/7, locally owned and operated, and Faster to Any Size Disaster. SERVPRO of South Shreveport has the training, experience, and equipment to restore your property to pre-damage condition. 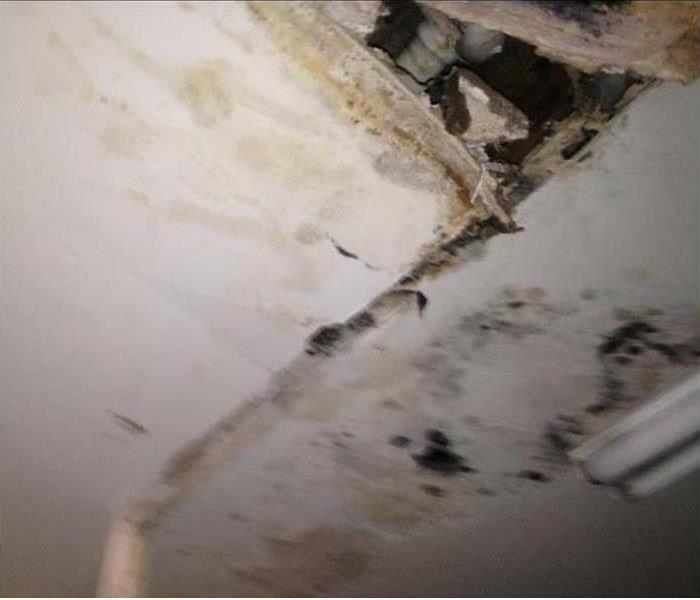 Water damage to this Shreveport home’s kitchen was caused by a broken water line leading to the dishwasher. 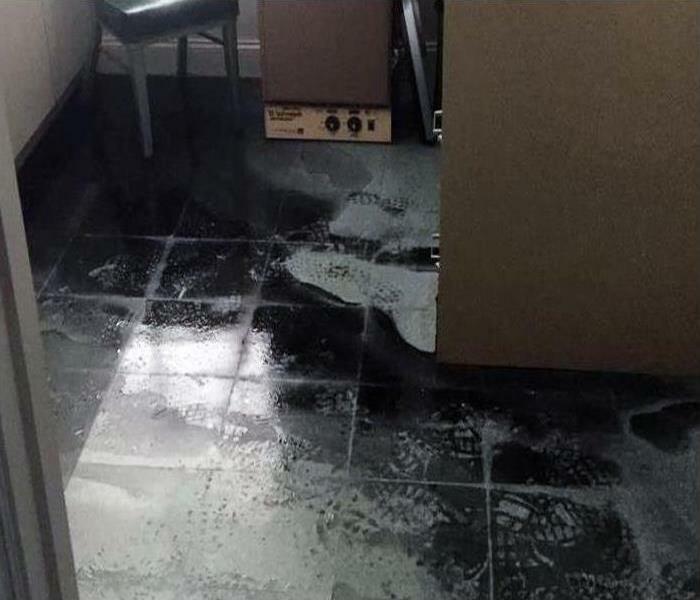 The property owners needed the services of a professional water damage restoration company to mitigate the damages before replacing the dishwasher. SERVPRO of South Shreveport is Faster to Any Size Disaster! When you experience a fire damage emergency, you can count on our team to respond quickly. We have the training, equipment, and expertise to restore your home to pre-damage condition. The dampness in this Shreveport house was the result of no interior climate control. 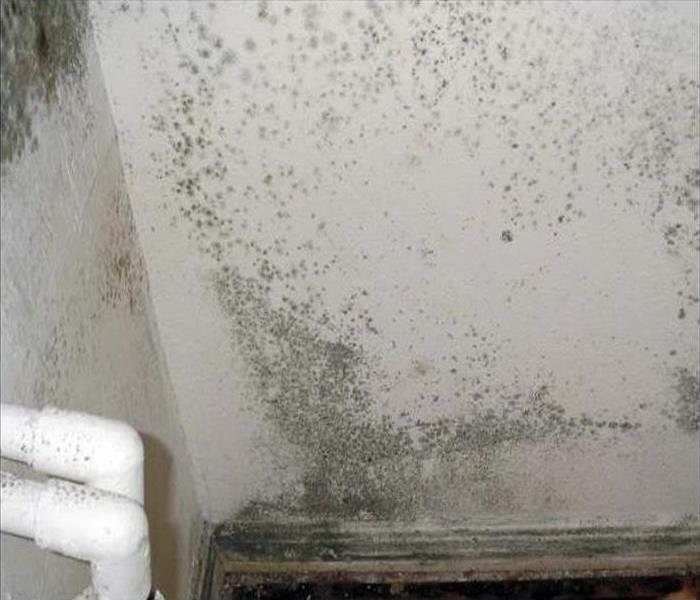 The accumulation of moisture provides sufficient water for dormant mold spores to erupt into many colonies. The only recourse, in this case, is a partial demolition. SERVPRO strives to restore and not replace, but only when possible. Water can wreak havoc on your business, and our team has your back. 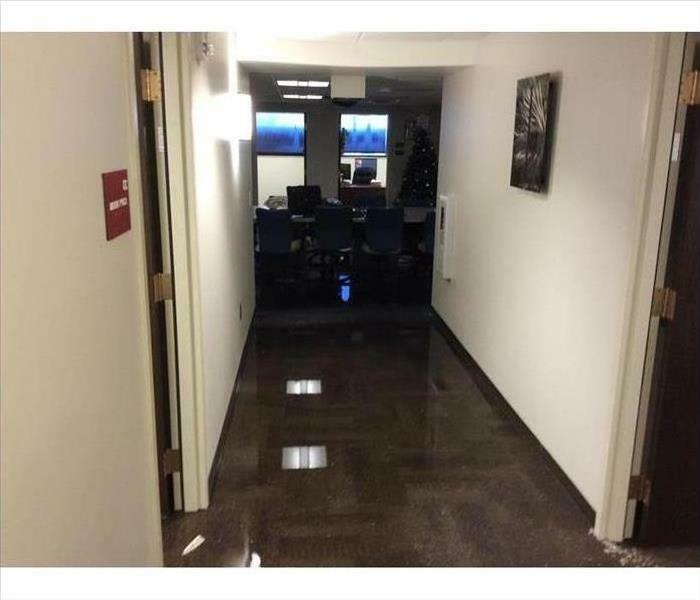 We are ready 24/7 to respond to your commercial water damage emergency. 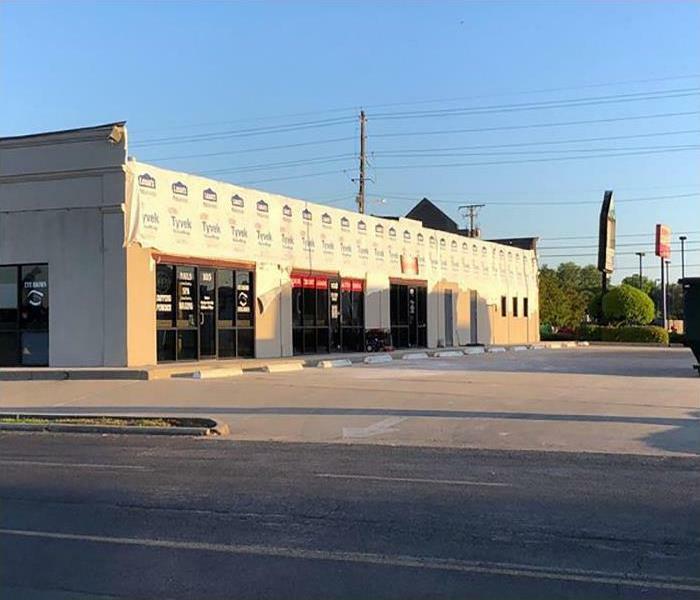 SERVPRO of South Shreveport has the experience and equipment to restore your commercial property to pre-damage condition. Stormwater ran along the ceiling, soaked into the panels and proved hazardous to the occupants. 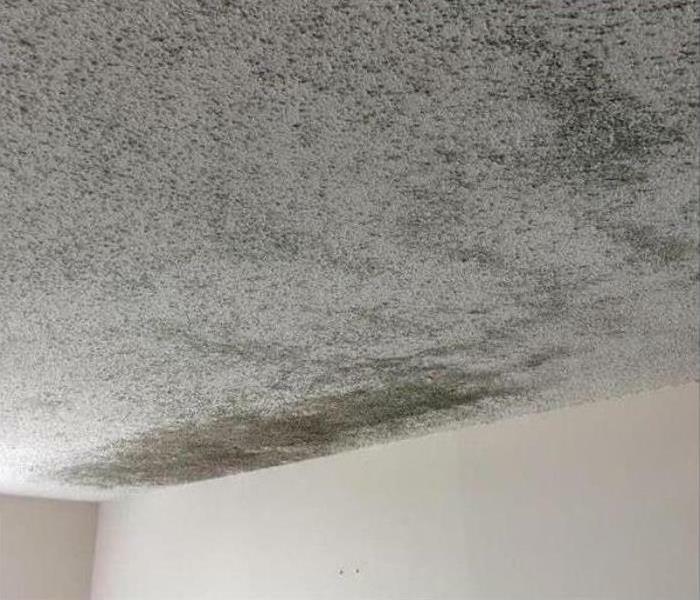 SERVPRO can quickly show up a Forbing property and punch weep holes to release the water, and then take down and discard the storm-damaged materials. Now we are ready for the cleanup and restoration. 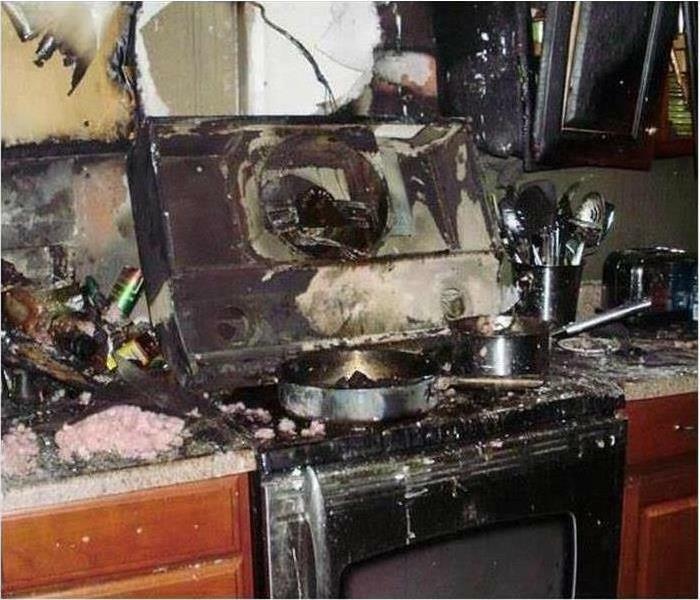 A fire can destroy your kitchen quickly, and you need a team that can handle any size disaster. SERVPRO of South Shreveport has a team of highly trained and certified fire damage specialists that are ready 24/7 to assist you. 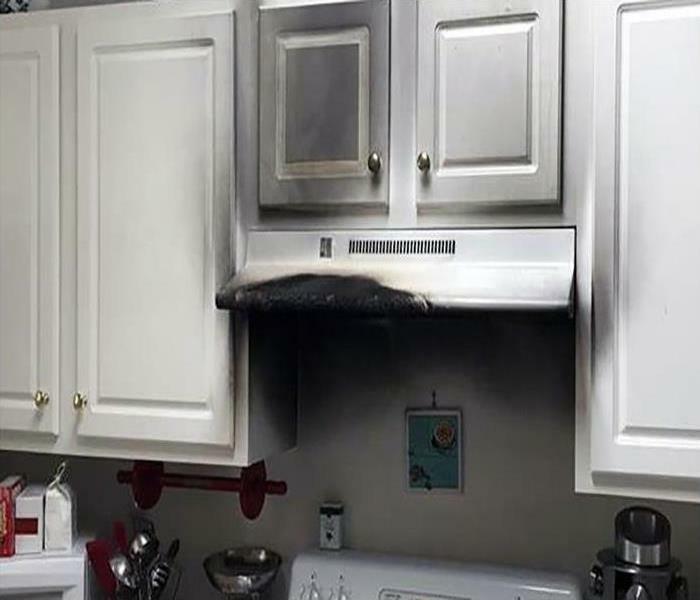 Our fire damage technicians have the equipment and experience to restore your kitchen to pre-damage condition. 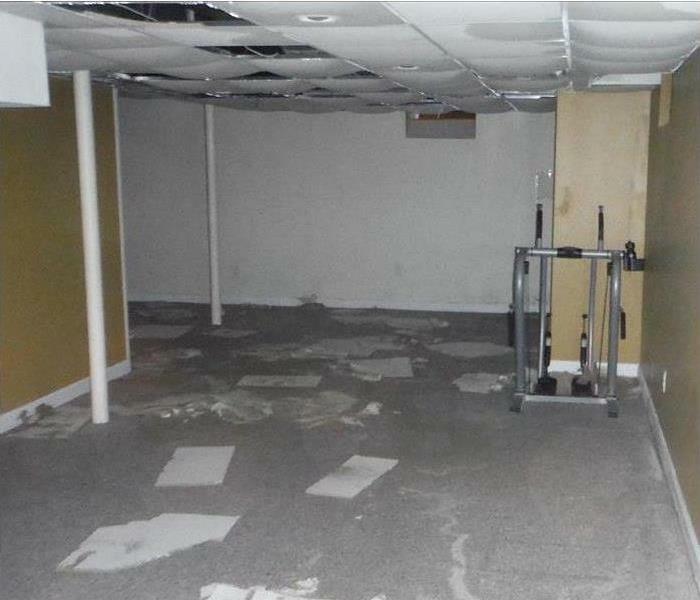 Mold damage to this Shreveport office originated as water damage. The building was vacant, and the moisture gave rise to the development of mold damage. The photo shows the combined damage to the ceiling of the office. 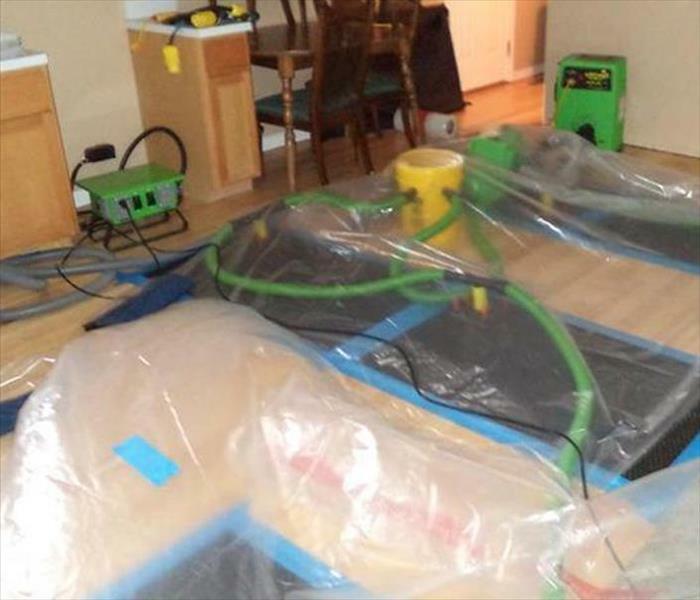 SERVPRO of South Shreveport industry certified technicians can remove all of the materials that could not be restored and clean the rest of the affected area. Once cleaned and dried the affected area would be treated with an antifungal substance before being rebuilt. 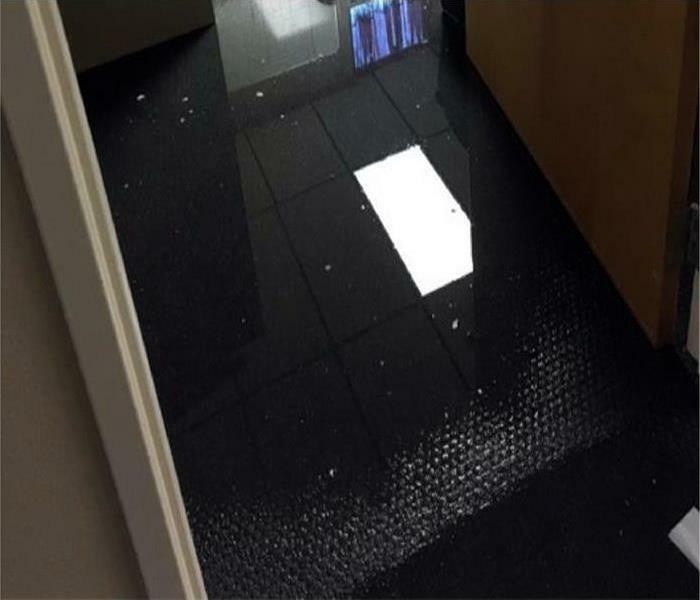 Water damage at this Shreveport office building left standing water throughout the pictured floor. 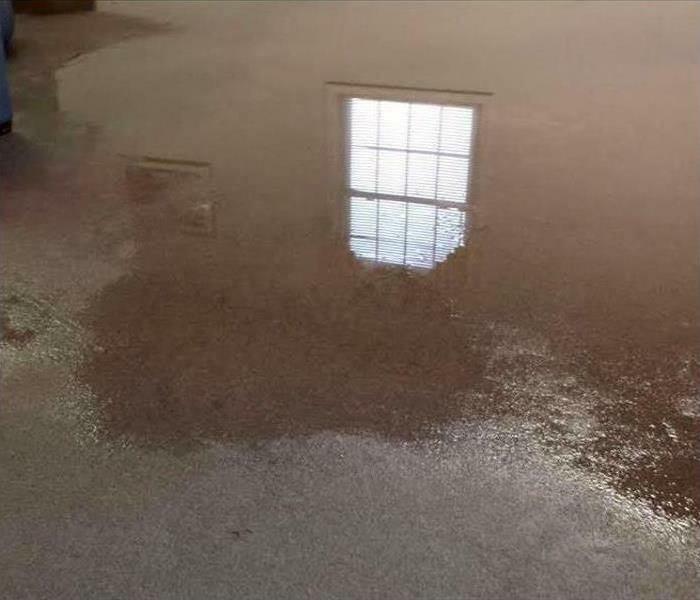 You can see the reflection of the ceiling lights in the standing water. The building manager knew he needed large-scale commercial equipment to get the water suctioned up quickly before secondary damage occurred. 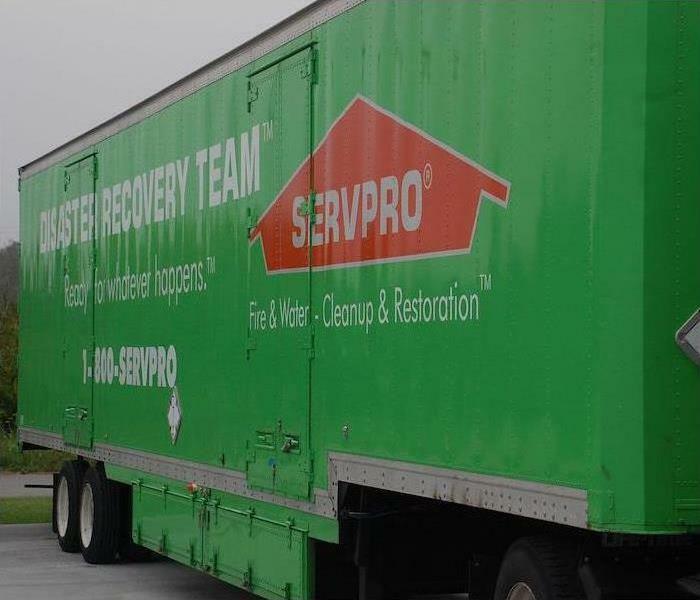 SERVPRO of South Shreveport is available 24/7 to handle our customer's disasters. 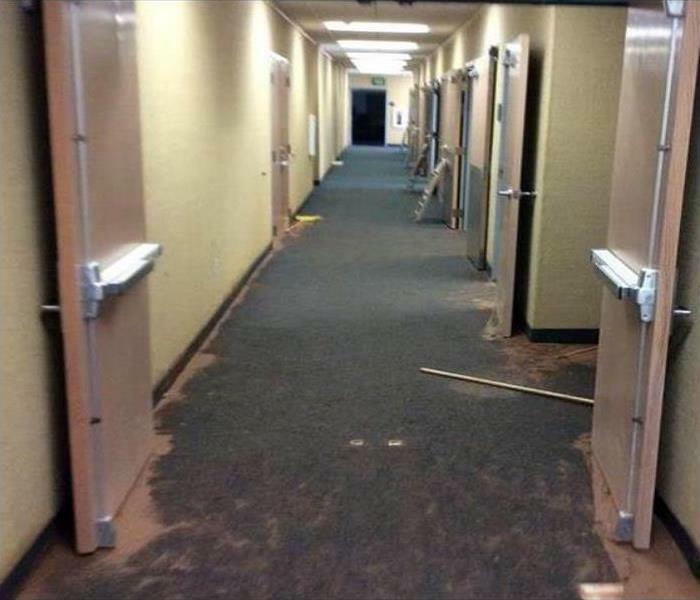 We have the commercial equipment and the trained staff to handle water damage such as this. 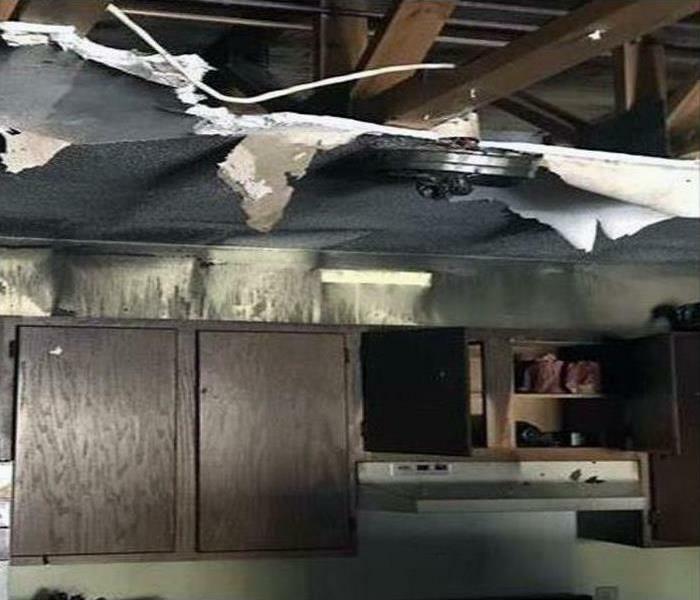 The hanging and soggy ceiling tiles in this storage area of a Shreveport condo was a hazard. 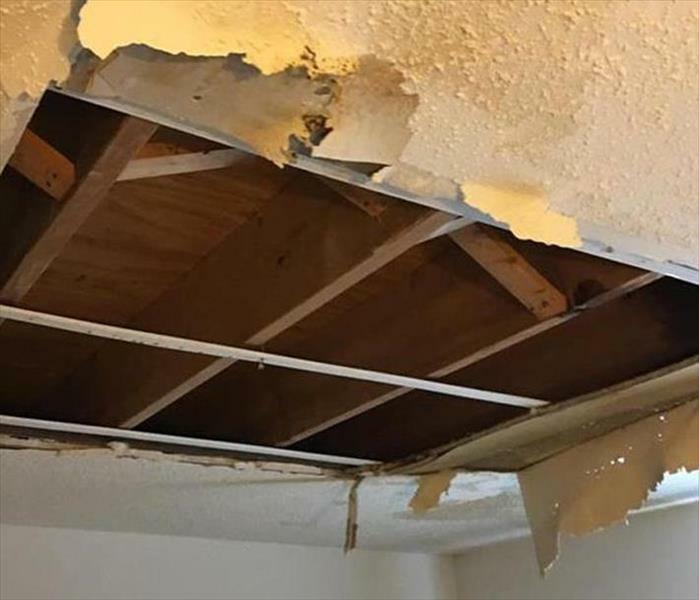 When SERVPRO works this kind of damage, the first step is to remove the non-salvageable building materials to lessen the chance of injury and also immediately to reduce the moisture level within the confined space. Fire damage at Shreveport residential or commercial properties usually leaves behind that nasty odor associated with fires. 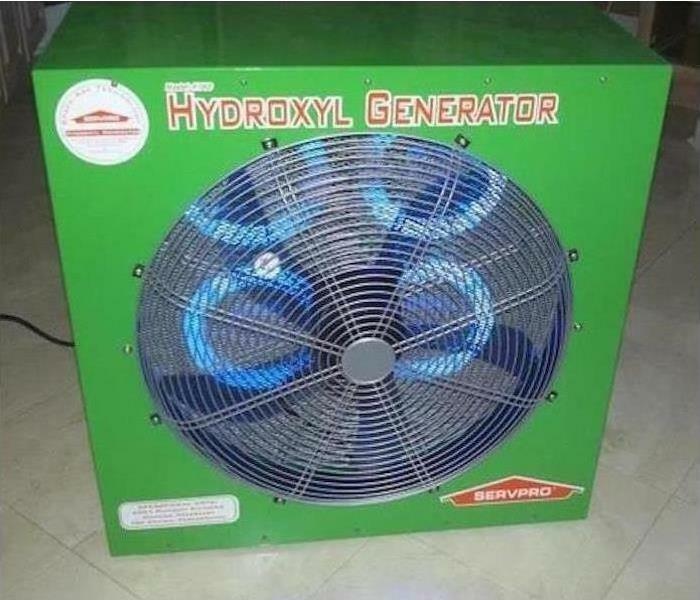 SERVPRO of South Shreveport sometimes utilizes hydroxyl generators to reduce the smoke odor. One of the advantages of using hydroxyl generators is that occupants of the structure affected can remain in the building since the hydroxyl generators use no ozone. An abandoned house in the Shreveport area can rapidly become infested and damaged by mold growth. When high temperatures and no climate control to stabilize interior humidity, this visual can be the result. SERVPRO, only a phone call away, can help. The straight-line wind storm ripped off a section of this roof in the Forbing area. SERVPRO quickly responded and began to secure the structure from further damage with blue tarps and a removal of debris. The homeowner was relieved that help arrived to swiftly. 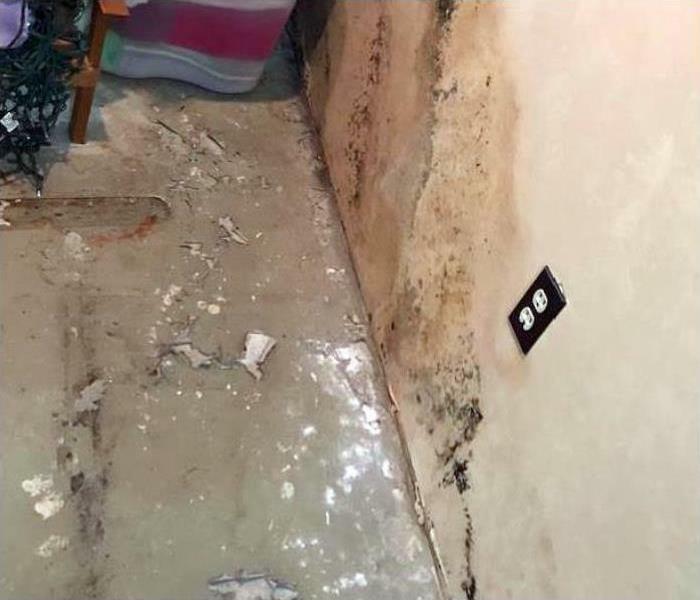 The water after the pipe burst in this family rec room in Shreveport needed fast water removal to mitigate damages to the furnishings and the carpet. 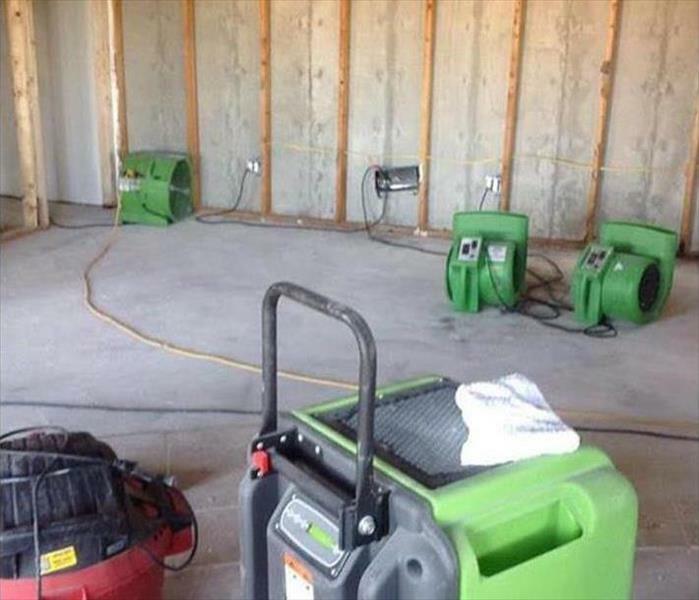 Luckily, our SERVPRO team responded immediately with some powerful equipment as evidenced by this photo. We work hard to save our customers money and reduce their inconveniences. 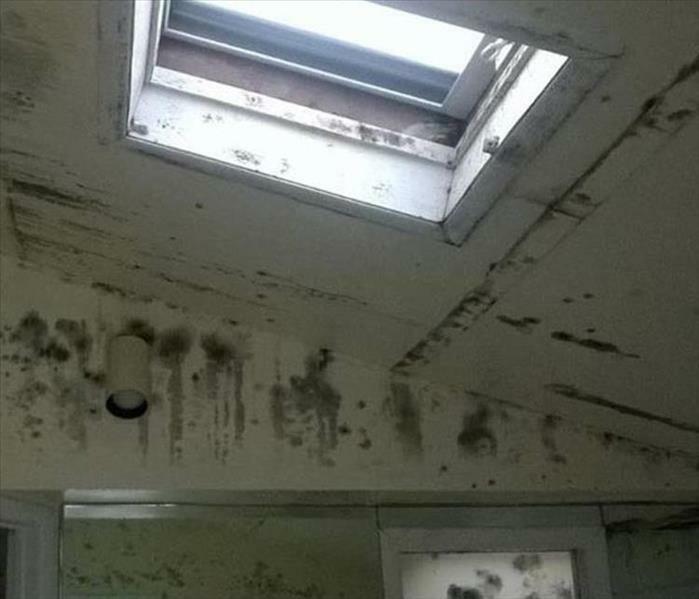 Neglect led to leaks that caused massive mold infestations in this Forbing structure. 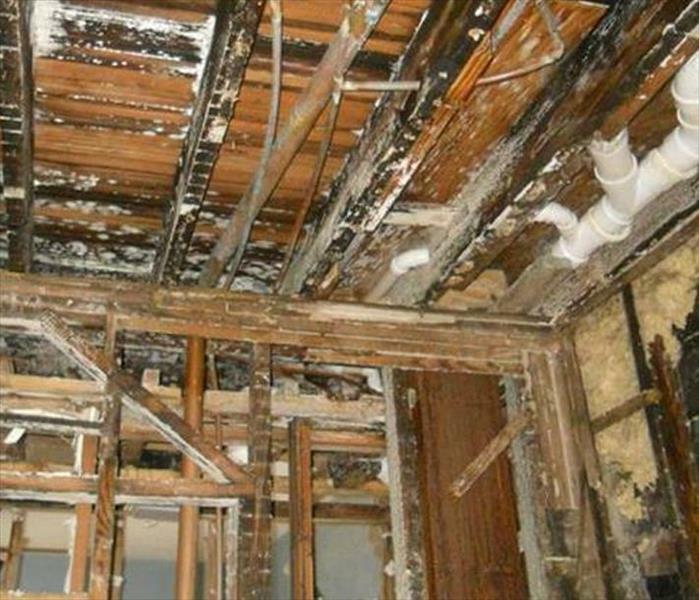 Demolition can be completed by SERVPRO technicians before the mold growths are scrapped off framing and subflooring. This building can be brought back to "ready for reconstruction" after an antimicrobial spray. 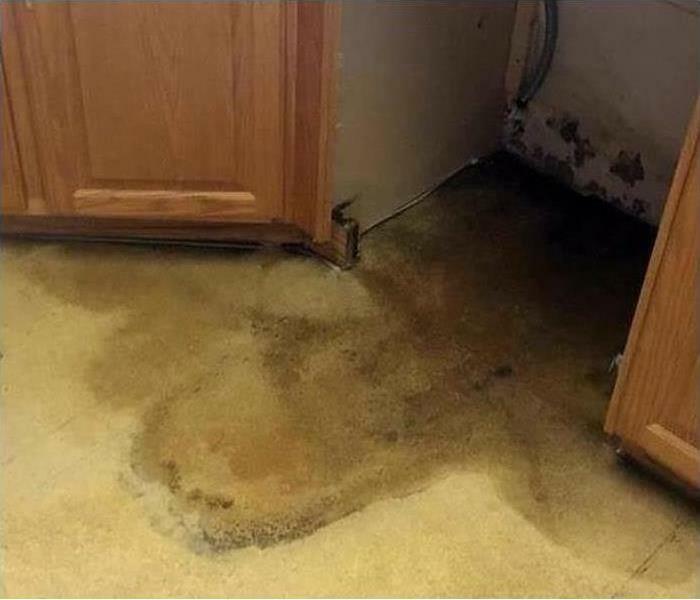 The water seeped into the joints and covered the varnished surface of this hardwood flooring in the Shreveport area. The tents and mat dryers are strategically placed by SERVPRO technicians to remove the water and dry out all cellulose-based components including the supporting beams. This recent weather event struck down a tree which fell through the roof of a master bedroom in a Haughton home. Fortunately, the room was vacant at the time, so the storm damage was confined to the structure and personal belongings. Our well-earned reputation--We're Faster To Any Size Disaster--meant our new customer immediately called up for help. Our Production Manager, Mike arrived swiftly with a crew to mitigate the damages and initiate the cleanup and pack-out some personal possessions. The picture illustrates the gaping opening in the roof covered with a blue tarp and demolition and removing of storm-damaged materials already underway. Count on SERVPRO of South Shreveport to help Haughton and other community residents when they need it most. 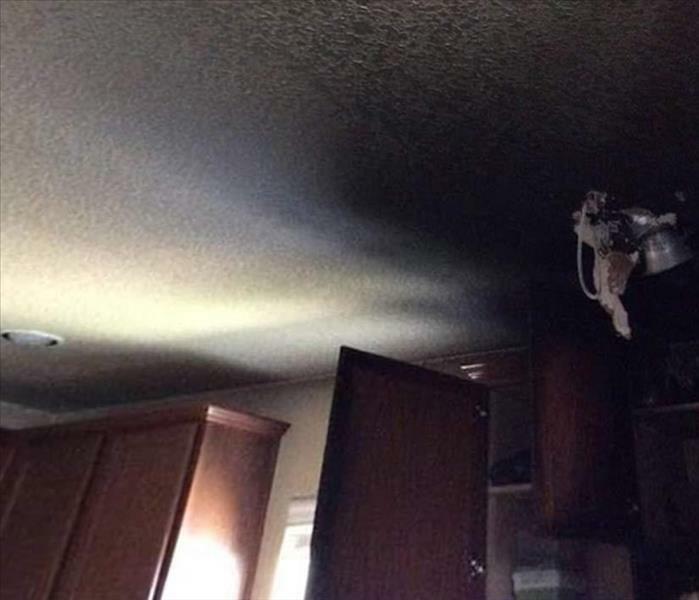 Fire damage in this Shreveport home’s kitchen started as a simple grease fire on the stove top. The small fire quickly spread into a large blaze which destroyed the kitchen. This entire kitchen would need to be demolished, cleaned and rebuilt. Other areas of the home would need to be treated for soot and smoke damage. 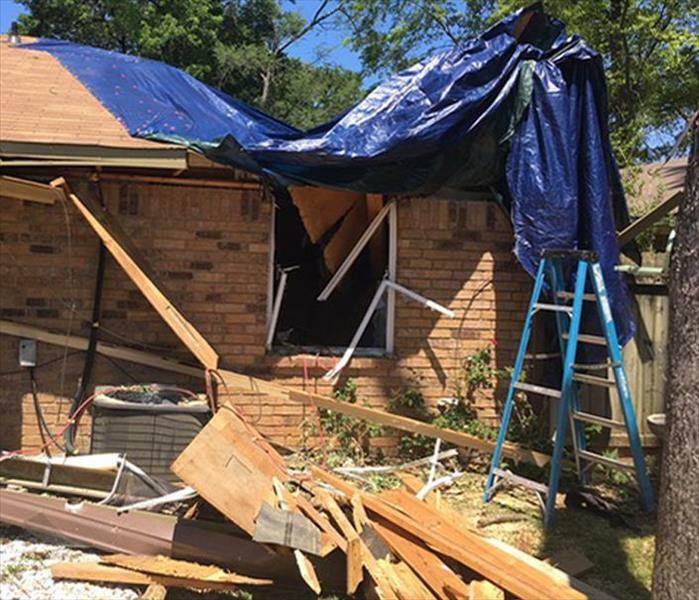 SERVPRO of South Shreveport has the personnel and resources to handle this entire project. 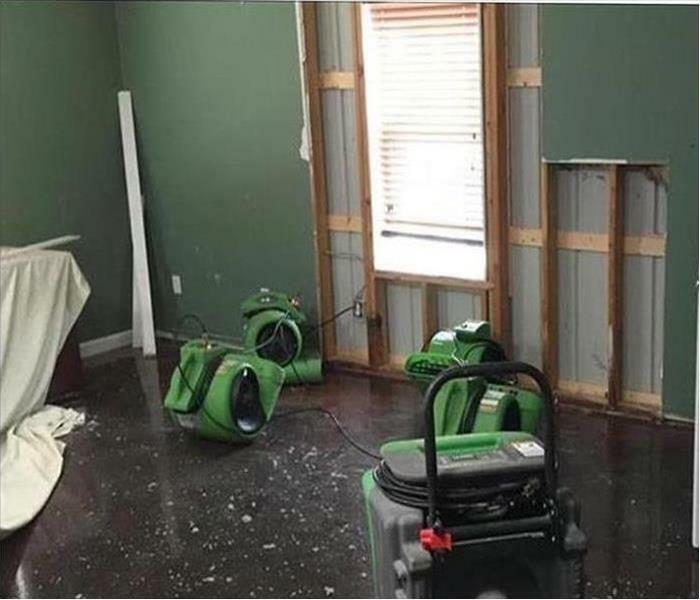 When commercial water damage takes place in Shreveport or the surrounding region, SERVPRO is ready to respond immediately regardless of the size of the loss. They have tractor trailer stocked with water damage restoration equipment ready to be dispatched to the loss site. These units are manned with specifically trained large loss specialists. Neglected, without reasonable RH relative humidity to help control dormant mold spores, the mold remediation at this Forbing property requires a large scale demolition. 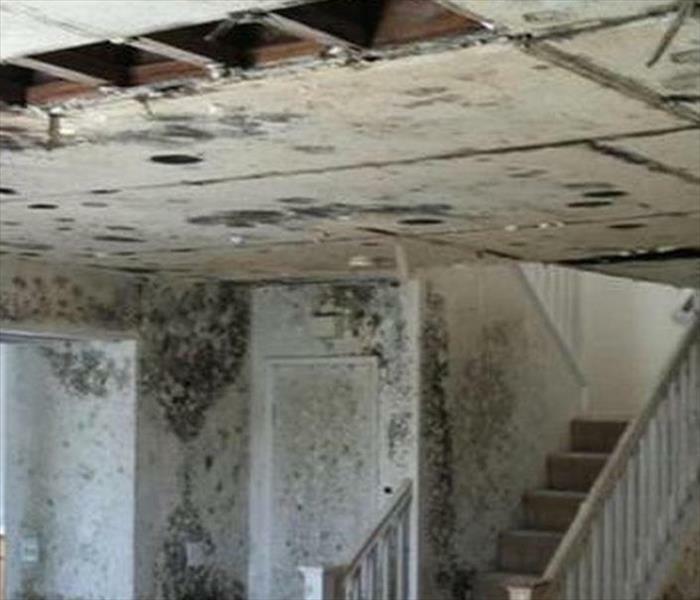 SERVPRO technicians have the skills and equipment to prepare this house for interior rebuilding by eventually spraying an antifungal agent to help eliminate the majority of the mold present. Controlling the proliferation, and the ambient air are key factors before rehabilitation. 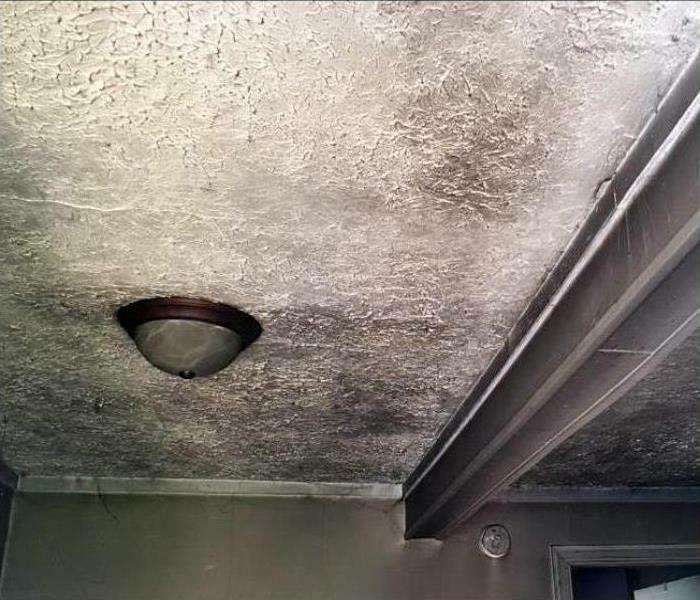 The blistered paint in this Forbing home revealed a large amount of accumulated water from a leak in the attic. 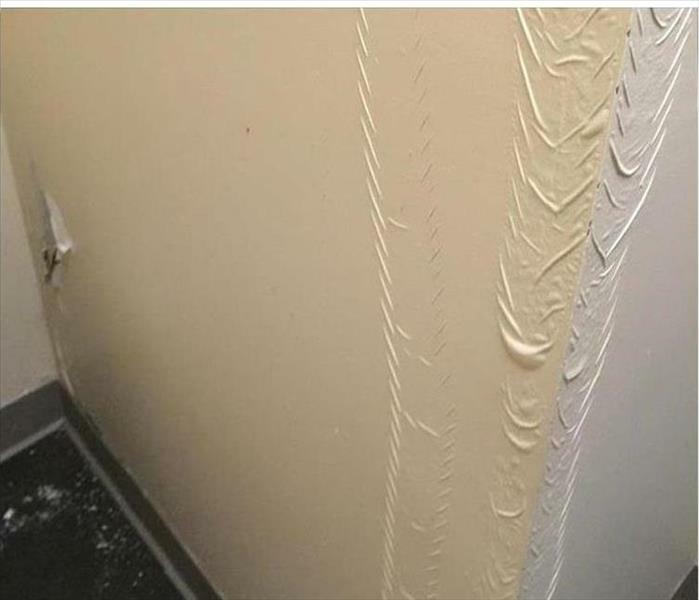 Typically, the degraded sheetrock needs to be removed and replaced. Then the wall opening can be inspected for further water damage and for applying an antifungal agent to prevent mold growth. SERVPRO techs follow a tried and true protocol. Small house fires in Forbing can still cause extensive smoke damage and staining. Popcorn ceilings are a challenge, even for skilled SERVPRO technicians, to clean up without smearing a making a larger mess. Count on us for a professional touch to your fire-damaging event.